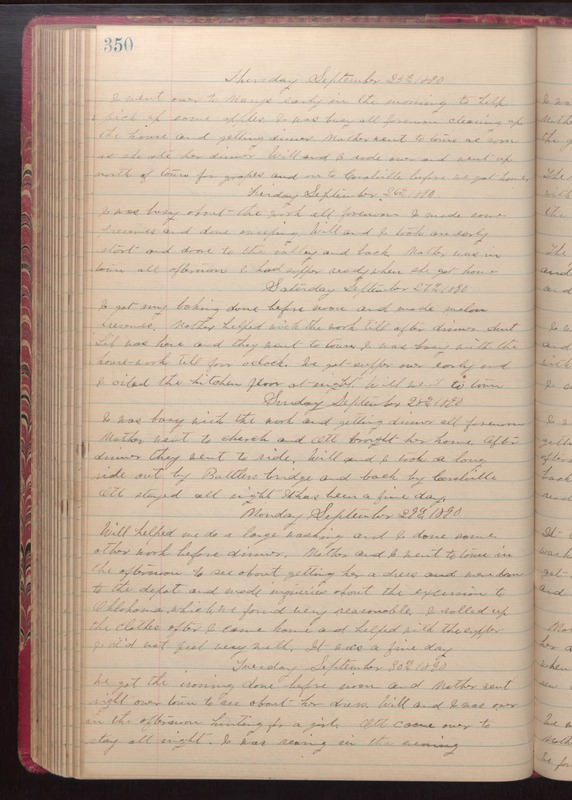 Thursday September 25th 1890 I went over to Marys early in the morning to help pick up some apples. I was busy all forenoon cleaning up the house and getting dinner. Mother went to town as soon as she ate her dinner. Will and I rode over and went up north of town for grapes and on to Coralville before we got home. Friday September 26th 1890 I was busy about the work all forenoon. I made some preserves and done sweeping. Will and I took on early start and drove to the valley and back Mother was in town all afterbnoon. I had supper ready when she got home. Saturday September 27th 1890 I got my baking done before noon and made melon preserves. Mother helped with the work till after dinner. Aunt Lif was here and they went to town. I was busy with the house-work till four coclock. We got supper over early and I oiled the kitchen floor at either. Will went to town. Sunday September 28th 1890 I was busy with the work and getting dinner all forenoon. Mother went to church and Ott brought her home. After dinner they went to ride. Will and I took a long ride out by Battlers bridge and back by Coralville. Ott stayed all night. It has been a fine day. Monday September 29th 1890 Will helped me do a large washing and I done some other work before dinner. Mother and I went to town in the afternoon to see about getting her a dress and were down to the depot and made inquiries about the excursion to Oklahoma which we found very reasonable. I rolled up the clothes after I came home and helped with the supper. I did not feel very well. It was a fine day. Tuesday September 30th 1890 We got the ironing done before noon and Mother went right over town to see about her dress. Will and I was over in the afternoon hunting for a girl. Ott came over to stay all night. I was sewing in the evening.